Airships lost much of their popularity after the fiery Hindenburg disaster in 1937. But one company’s looking to revive the technology with the biggest aircraft on Earth. It’s called the Airlander 10: over 300 feet long, it’s a floating airship that’s 25 percent bigger than a Boeing 747. 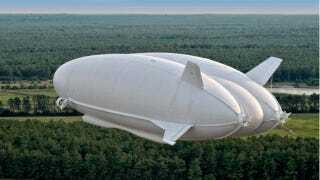 It’s 1,340,000 cubic feet in volume, and can soar up to 20,000 feet and move at 90 miles an hour cruising speeds. It’s made by Hybrid Air Vehicles (HAV), a British company that wants to make quiet aircraft that also don’t pollute. Like a blimp, the Airlander lacks internal structure but keeps its shape with a helium-filled hull made out of Vectran, a tough fiber spun from liquid crystal polymer that resists cuts and moisture. It can take off and land anywhere like a helicopter—no ground crew or additional infrastructure is needed. So, besides size and speed, how’s this different from your run-of-the-mill Goodyear? Why go through all the effort to build something with a record-breaking size but is considered an antiquated vehicle? Because of its cargo-carrying potential. The company says it can lug up to 10 tons for 1,500 miles. You could even argue that the Airlander 10 is really just a giant drone, because it can fly without a pilot. With humans aboard, the company says it stays afloat for five days, and if unmanned—over two weeks without any need to refuel. Those are features that could also open up possibilities of military surveillance. Despite its lighter-than-air construction, the aircraft is still laded with useful tech, like a weather radar that helps the UAV dodge storms. According to CNN, the monster drifter could also be powered by solar panels in the future, and the company also says it burns 20 percent the fuel of standard airplanes. Incidentally, HAV originally planned to build it for the US Army (hence the UNITED STATES ARMY plastered on the vehicle in the vid below), but budget cuts kept it in the UK. The company later scored a $5 million grant from the British government, and now the first flight tests are on deck for later this year. I don’t think anyone’s arguing that airships could ever rival airplanes (hopefully we’ll have high-speed rail that’ll do that), but airships have also had other near-comebacks in the past, too. Maybe it’s best to enlist some healthy skepticism, but we hope this inflatable fortress goes nowhere but up.